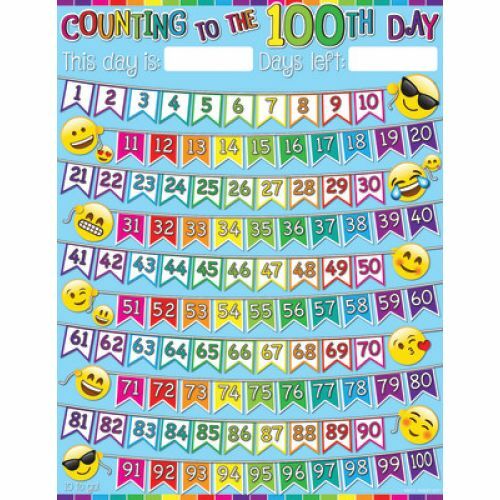 Smart Poly™ Counting to the 100th Day Emoji 17"x22" - Simply cross off each day that passes with a flag banner design! 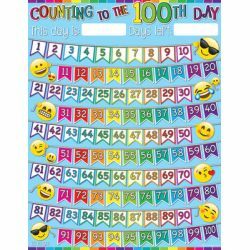 Super bright and colorful, easy to keep track off! Wipe clean for another countdown of choice once the 1st 100 days have past! Write-on, wipe-off heavy duty, washable all POLY chart. NO LAMINATION NEEDED, NOT A PAPER CHART. Use with dry erase and damp wipe markers. Use pins, tacks, staples, etc to hang in classroom or home. Great for reusable learning.